Located at a distance of 11 km from Jaipur, the Amber Fort situated on a hilltop in Rajasthan is a popular tourist attraction. 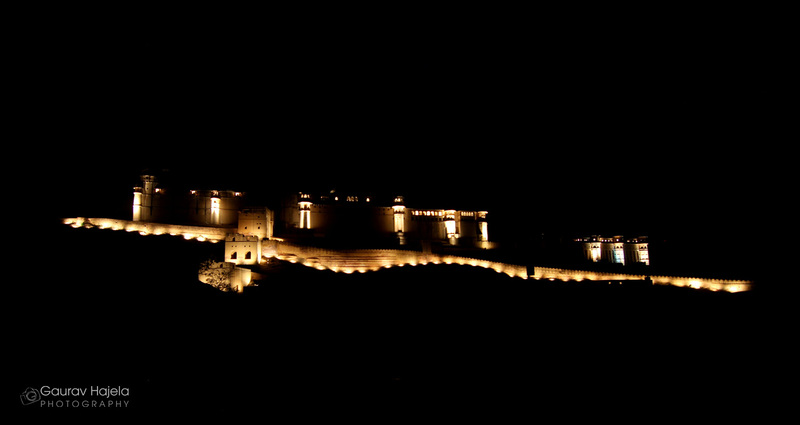 The fort was constructed in 1592 by Raja Man Singh and was modified over a period of 150 years by successive rulers. Amer Fort is known for its artistic style, blending both Hindu and Rajput elements. With its large ramparts, series of gates and cobbled paths, the fort overlooks the Maota Lake, at its forefront. 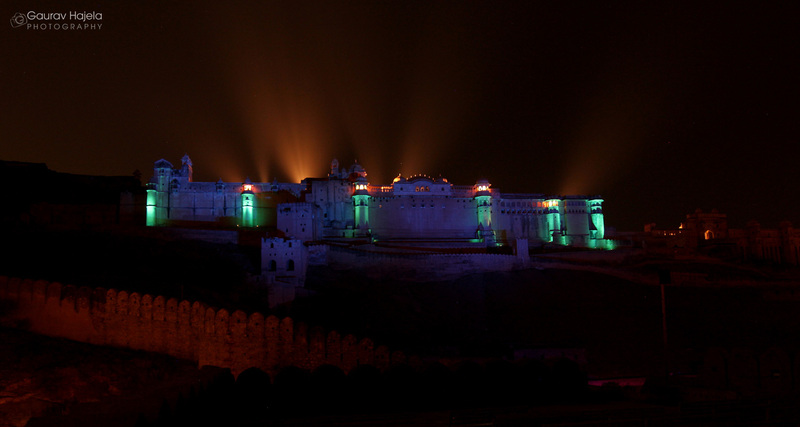 Apart from its legendary past, the thing that captivates the attention of the tourist & of locals as well is the history of Amer Fort, which is brought to life through an amazing cultural performance- The Amber Fort Light & Sound Show. The show talks about the town of Amer, about the history of Jaipur, its rulers, historical monuments, the historical background of the fort, ancient anecdotes associated with it, its traditions and the grandiosity of the royal family. The show starts every day at 7.30 in the evening with an energetic backdrop of rocky walls for the light effects. Settle on time at the bottom of the hill and watch as the story of Amer Fort comes to life, blending history with music & light effects. During the 50-minute show, admire the colorful lights that illuminate the structure and reflect beautifully on Maota Lake, and gain an understanding of Amber Fort’s legendary past, dating back more than 600 years. Learn about the 28 kings of the Kachwaha Dynasty who ruled a number of kingdoms in the area and see how they played a part in changing the destiny of medieval India. You’ll leave the show with a deeper understanding of how the Indian state of Rajasthan has developed its unique identity. Set up in a very exotic location, with the panoramic view of the Amer Fort & Palace complex in the front, the rising Jaigarh on the left, the hills at the back and the gallery itself in the KesarKyari Complex of Maota Lake makes the show even more impressive. The eternal spirit of this royal palace comes alive with thundering music and numerous colorful flashing lights. Bollywood lyricist and filmmaker Gulzar penned the dramatic script for the show. Amitabh Bachchan, probably the most recognizable voice in India, voices narrative of the fort’s glorious past. The show is an attempt to revive the pride of Amber, bring forth the traditions that colored the lives of its people, the pomp that once existed in its fullest form and to end the silence that had long fallen. The spirit of Amer is eternal. This musical extravaganza has highlighted the local legends, folklore and a connoisseur of folk music that continues to give Rajasthan its exclusive identity. Next Post Eat Right…..Monsoon Arrives ! W.e.f. 01st October 2013 the timings for The Sound & Light Show at Amber Jaipur & Jantar Mantar has been changed as 6:30pm English; 7:30 pm Hindi. you may confirm the same at the no. 0141- 2531042, 2616262, 2530844, 935161590055, 9351599799 & 9351617799. Thanks for your kind co-operation & support.